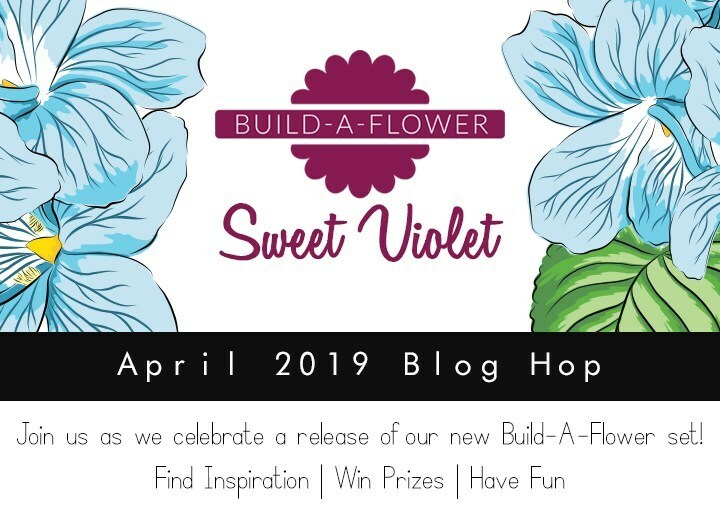 It's such a pleasure to join this spectauclar blog hop featuring the newest Bulid-a-Flower release from Altenew ... the Sweet Violet! 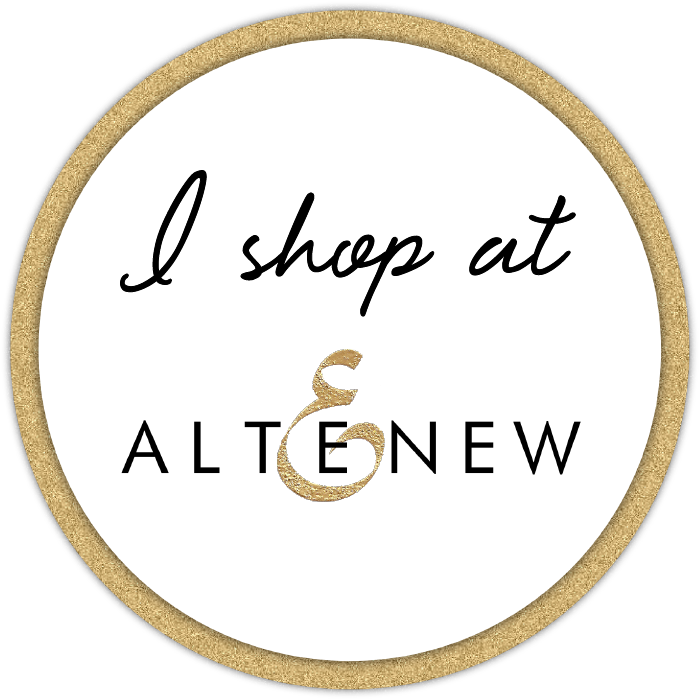 You may have just come from Janette Kausen's blog, but if not feel free to start at the beginning of the hop at the Altenew Card Blog. One of the reasons I just love the Build-A-Flower series of stamps is that it's so quick and easy to create a beautifully detailed flower just by following the formula of layered stamps (with or without the coordinating die). Before I knew it, I had a huge pile of adorable purple violets that ended up as a sweet set of cards. This is the first card I created ... very simple, just arranging the flowers in a cascading arc with the leaves filling in the spaces on the side. The sentiment, one of the many included with the set, is stamped on the base panel with the key word embossed in gold. Now it's time to use up the leftover violets! 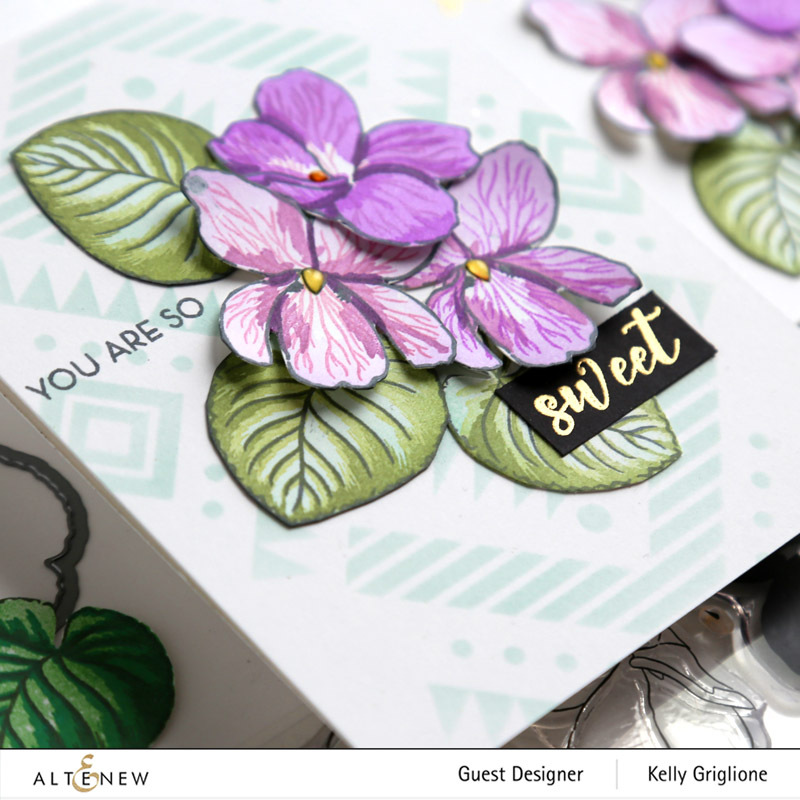 For my next card I clustered the violets in the center of a card that I stenciled the Aztec Motif on the base. For all of my cards today I just adhered them to the card base in the middle of the flower. I used my fingers to gently curl the petals up so they would stick up and add lots of dimension to the card. Bonus ... there's no extra bulk for mailing! 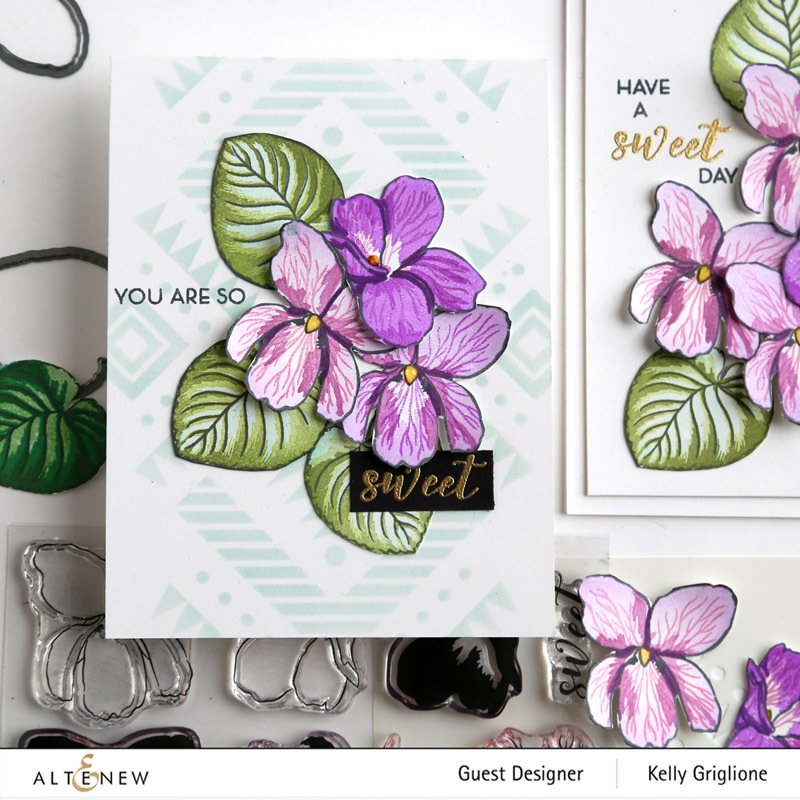 This card is similar, with the violets clustered on one of my favorite Altenew stencils for backgrounds, the Flowing Drops Stencil. This time I left the leaves off the card and just focused on the flowers. For the yellow middle of all the violets I used Nuvo Drops to get some shine and even more dimension. Finally, to use up the rest of the violets, I thought it would be pretty dramatic to adhere them to a black card base. Especially since I manually cut them out and eliminated the white outline that you get when using the coordinating die. I curved the sentiment on the acrylic block before stamping and embossing it. I'm especially loving how the green leaves look against the black. I'm so glad I took the extra 10-15 minutes to put the remaining violets on additional cards while all my supplies were out, and while I was "in the moment," creatively speaking. These three are all very similar to each other, and would make a nice set to gift someone. In addition to the Sweet Violet Stamp and Die bundle, you can also order the Stamp, Die and INK bundle (at a 5% discount) to eliminate any worries about having colors that fit with this flower. Your next stop on this hop is the inspirational scrapbook artist Patricia Roebuck who has something wonderful to share with you! Thanks so much for stopping by. Sure hope you're enjoying all the wonderful inspiration from all of these talented crafters! Kelly Griglione<--- you are here! I love how all of these cards look! All of your cards are just stunning! Your really created some gorgeous, life-like images. I am drooling over your last card... LOVE the rich colors on the black background; with the touch of gold, it's all perfect! 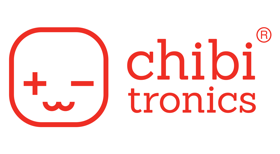 TFS!! These are so soft and delicate. Really pretty! I love the cascading effect. Who wouldn't love receiving one of these in the mail? Wow! The black background really makes your flowers come alive! Beautiful cards! I love the black as well. Great designs! I really like the black base for the flowers. Makes the pop. This is a very sweet set of cards, I think the black one os my fave. Beautiful set of cards!! The black background is my favorite. Quite stunning!! Wow! That is a lot of violets! Beautiful cards. I especially love the black card. The purple is so rich on the black background. Gorgeously! Lovely! All of your cards are beautifully done but the black one is stunning. I would frame that one. Fabulous set of cards! Love the black background. Stunning!! Love the cards and the stamp set..
Lovely cards! The black background is so striking!! I love each one of your cards. But, the card with the black background is absolutely amazing...catches the eye...gorgeous! Such inspiration! Love the variety Kelly, they're all pretty! OMG! Gorgeous! I LOVE the bright purples! I love the gold embossing! Lovely examples! Thanks for the inspiration. The black background is my favorite, but they are all really beautiful! Am loving all of your inspiration and especially varying of the bg's and color schemes so as to show the versatility of this newest set!! LOVE it! All the cards are beautiful but the one with the black background is especially striking! Violets are one of my favorite flowers! Tricia Podmore here. Gorgeous cards, especially the black card as it is sooo stunning and striking. Thanks for sharing! As I'm taking another look at these cards today, I realize that part of what I like so much is the way you captured the realistic look of the leaves! The flower petals have the same realistic look with the colors you chose for the veins. I'm wondering how long I've been a Kelly fan how long it's been since Leibster awards? HaHaHa! Wow! You were so creative with each one. I love the flowing drops one and the one in black....... My two favorites. But all are beautiful. The card on black is my favorite!!!! I would have not even given it thought to try that with flowers. I can't wait to try. I wanted to pick them and put these sweet violets in a vase. They are stunning on black! I remember pressing violets to make cards, Kelly. Yours look just like them - so cute and dainty. I can't believe you cut all of those out by hand. It's not something I would look forward to but I do love them without the white border. They are all beautiful, but the black card is my favorite...the flowers just pop! The dimension on these cards is fabulous. I can't decide which one I like best.....toss up between Have A Sweet Day and the bold purples on black! I would take any of them---they look so real. 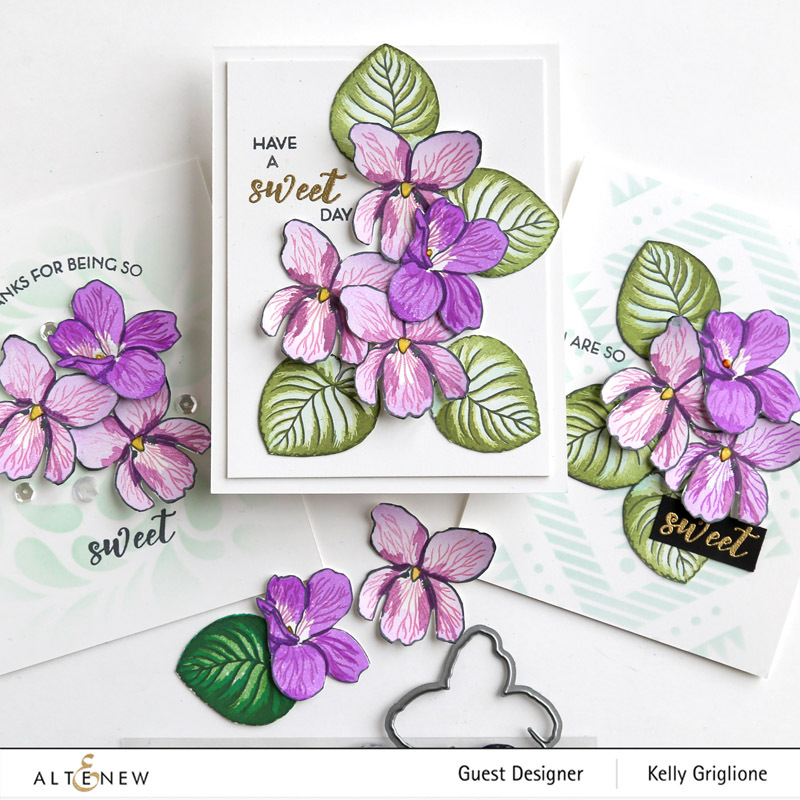 Beautiful set of Sweet Violet cards! LOVE the soft stenciled backgrounds and the black background really shows off your stunning blooms. Awesome cards! Love the colors and dimension! The violets are just gorgeous! The purple violets on the black background is out-of-the-park spectacular! My fave for sure!! Wow - I love each and every card they are all gorgeous! These are all beautiful, and the black base card is stunning! Fabulous cards! Violets are one of my favorite flowers and I love how you captured their look and added dimension! 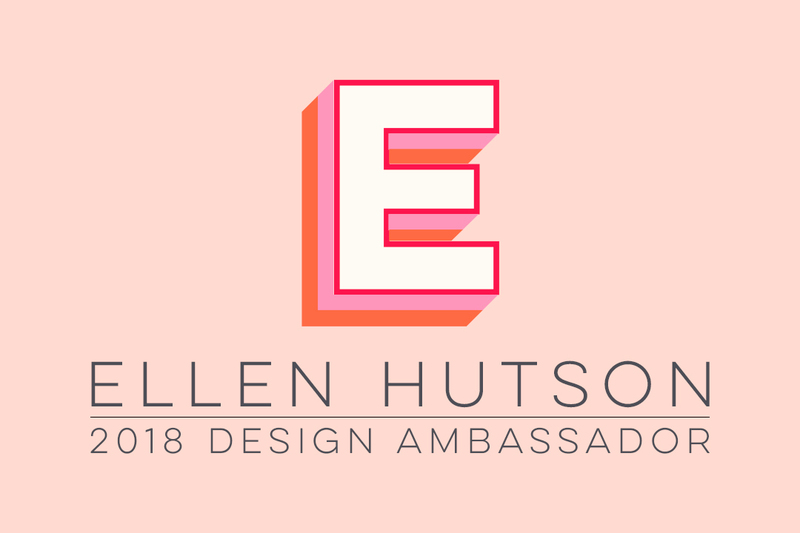 Gorgeous designs Kelly. Love this new BAF set, thanks for the inspiration! I am just amazed at how real these violets look. Gorgeous projects! Beautiful cards! I especially love the one on the Aztec background. I'm a total sucker for anything geometric with floral. The black background is also quite stunning! Thanks for sharing! 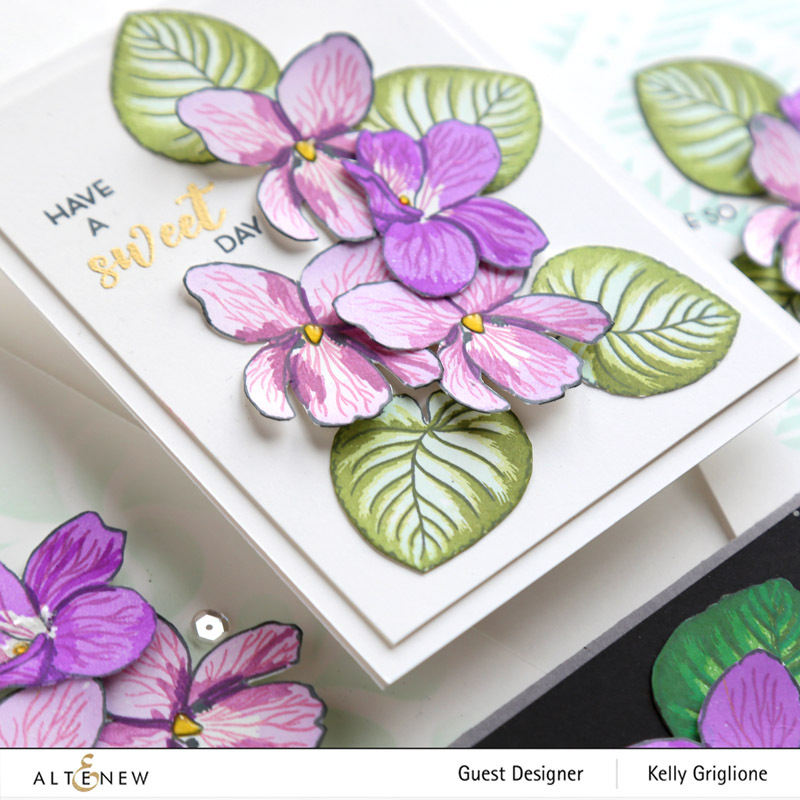 VIBRANT violets and BEAUTIFUL cards EVERYWHERE! Wow! Thanks so much for sharing and for your wonderful inspiration! What a stunning set of cards you have created! Beautiful cards. Love all the purples. And the purple on black is especially stunning! Thanks for the inspiration. Purple on black is so dramatic. Love the shuttle backgrounds. Thanks. Wow! the cards are stunning! Love the gorgeous colouring. The new BAF set is really fantastic. Your cards are lovely, and I like how realistic your violets are! Gorgeous cards - I love this release. Your violets look wonderful and I especially love it with the black card and the gold embossing. All your cards are gorgeous. I love the beautiful Sweet Violet and the gorgeous purple coloring. These are all so pretty. I really like all the stenciled backgrounds. The black is a great background for making those dark purples pop. Fantastic! I love these cards. The flowers are gorgeous. They remind me of my grandmother's violets. Fabulous cards! thanks for sharing! The dimensionality and colors in your cards are amazing! I need the dies for the violet stamps.